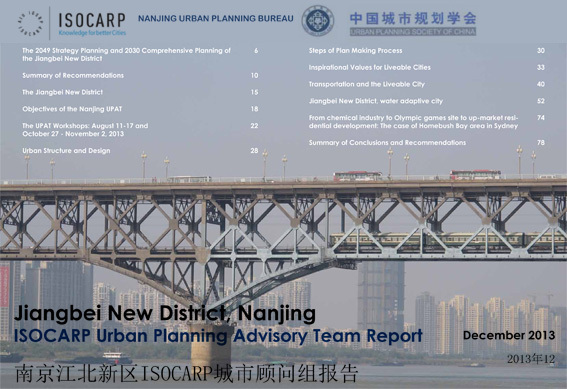 ISOCARP UPAT Report – Jiangbei New District, Nanjing. The ISOCARP experts visited the Nanjing Urban Planning Bureau in August and October/November 2013. During their visits they made field observations, listened to presentations of the sectorial teams responsible for various sections of the plans, listened to the opinions of the Chinese experts and carefully reviewed the plans for the Jiangbei New District. The ISOCARP experts then communicated their ideas, international best practices, and suggestions for improvements in the plans. The experts came up with eight guiding principles that they felt could greatly benefit the planning process of the Jiangbei New Area. They discovered a number of weaknesses in the plans and recommended improvements to alleviate them. Acces the report by clicking on the picture below.